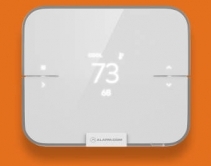 By Jason Knott · January 11, 2018 • New integrator-friendly Alarm.com connected thermostat uses machine learning and cloud intelligence to anticipate HVAC failures and water damage. By Jason Knott · January 5, 2018 • 46 public stocks tracked by CE Pro rise 40.53%, led by Sharp, Control4, LG, Samsung and Sony. By Rodney Bosch · November 9, 2017 • Alarm.com reports year-over-year Q3 revenues of $90M, an increase of 32.6% over 2016's Q3 and a 4.6% jump vs. Q2 revenues this year. 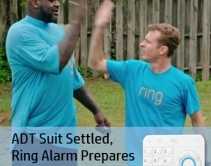 Video doorbell cited as key to success. By Julie Jacobson · September 6, 2017 • SHaaS (smart home as a service) provider ipDatatel merges with security provider Resolution Products in a merger backed by former Alarm.com chairman Ralph Terkowitz and his group ABS Capital. By CE Pro Editors · August 10, 2017 • Alarm.com's total revenue increases 33% while SaaS and license revenue increases 40% following the acquisition of Connect and Piper business units from Icontrol. By Robert Archer · June 16, 2017 • IC Realtime leads the way for the sixth year straight. Lilin and Vivotek fall out of the top five, with Alarm.com and Hikvision taking their places. Check out the complete list in our 2017 Brand Analysis. By Robert Archer · June 14, 2017 • Fueled by its OvrC platform, SnapAV is the new Remote Managed Services category leader. Ihiji, Pakedge, BlueBolt and Alarm.com also saw significant additions. Check out the complete list in our 2017 Brand Analysis. 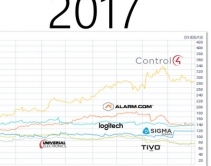 By Robert Archer · June 13, 2017 • Control4, Crestron and Savant lead the whole-house automation category, as Lutron and Alarm.com emerge beyond lighting and security to follow. Check out the complete list in our 2017 Brand Analysis. By Steve Karantzoulidis · June 12, 2017 • As Alarm.com stocks see record share price after Icontrol acquisition, two top executives sell nearly $2 million in stocks and options. By Steve Karantzoulidis · May 24, 2017 • Alarm.com customers can how use voice control with their Google Home to arm and disarm their security systems, unlock doors, change the temperature, turn the lights on and off, and more. By Jason Knott · May 10, 2017 • Alarm.com reports quarterly income of $74.2 million with forecast for full year of 2017 up to $325.7 million. By Julie Jacobson · April 12, 2017 • Alarm.com, Honeywell and start-up Huny show whole-house audio integrated with security and home automation – a first for the alarm industry with potential to lure in traditional A/V dealers.